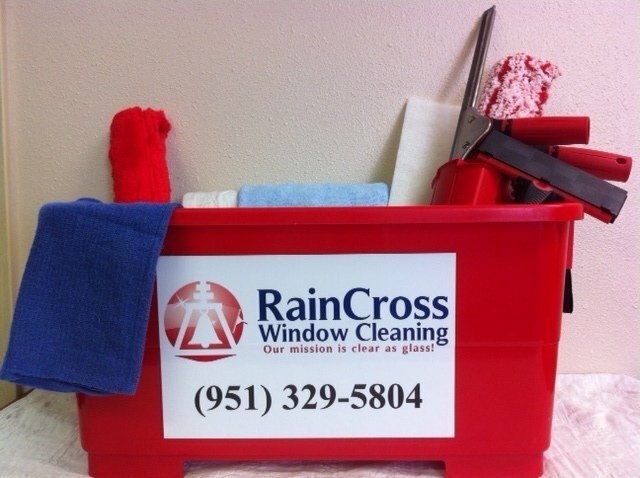 RainCross Window Cleaning is a family owned company proud of the reputation we have developed for integrity and service. We feel our character and the quality of work we provide is why many existing clients refer us to their close friends and family. We are small enough to handle the simplest of jobs yet large enough to clean the windows on large multi-story buildings (like La Sierra University Dorms, Residence Inn’s, and a number of buildings you are likely familiar with). We have lived in Riverside area for 20 years and have established deep roots in the community and are members of the Riverside Chamber of Commerce. We do things right. This is our business. We don’t work out of our home, we have a real office and are completely licensed & insured. In short we are reputable; the kind of people you would want as neighbors and the kind of people you will enjoy doing business with. We hope you will give us an opportunity to earn yours and provide such a good experience you will want to refer us to those that matter to you. We have an extensive safety program and we take it seriously. If we need special equipment to complete a job we will not start until we have equipment on-site. Our employees are trained in boomlift, harness, and even the highrise! Let that gave you peace of mind that we will not put ourselves at risk on your job-site. We offer flexible scheduling based around customer preferences. We will work with you to find what works best to keep your windows looking clear and clean for the best possible prices. We don’t like to sit at home just because the weather man said there’s a 20% chance it might rain, time is money. We pledge that if it rains within 2 weeks of your window cleaning service, we will come back free of charge and touch up your windows if they are in need of attention.